As my NZ readers will know, this year Waitangi Day fell on a Tuesday and so we got to experience the weirdness that is a week intersected by a public holiday. I was confused for seven straight days, and we’re just going to blame that for the retail procrastination that I engaged in on Waitangi Day. I was supposed to be working on this blog, but instead I was tooling around on Instagram and then I found Lazy Day Vintage and then it was all over. I was now the proud owner of a three piece outfit (including an AMAZING suede vest, not pictured in this post but you can spot it here) and a pretty scarf. The great news is that the financial cost of my procrastination was super low – coming in at $50 for that set, which is frigging fabulous when you consider a thin merino rollneck jersey from Glassons will set you back about $30. Not only did I score an excellent suede vest, I got a nice thick, ribbed woollen jumper and a wool skirt…truly bargainous. This is one of the things I have learned directly from buying vintage – good quality, natural fabrics will last if you look after them, and unlike polyester and its other plastic chums, wool and silk and linen (et cetera) don’t go out of favour. Vintage and preloved sellers are a great place to find warm, high quality clothes for a pittance and, as I hope I’m demonstrating here, you can buy classic shapes and avoid looking like you’re on your way to a dress up party. Apart from (once again) singing the praises of preloved and vintage clothes, I also thought this post was timely because there is a ton of pink in the high street stores right now. If you follow along on my Instagram Stories, you know that I went into Country Road and was literally surrounded by pink. While we’ve lived in the insipid world of millennial pink (rose gold, and marble, please poke my eyes out. It’s so boring) we’re finally moving into new and more vivid shades of pink. Fuchsia is going to be HUGE in coming seasons, but for now this slightly richer rose pink seems to be the winner. 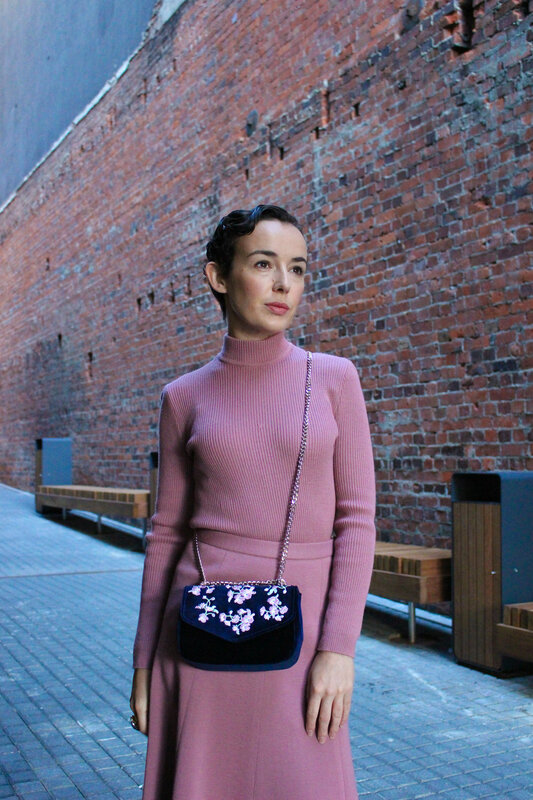 Pink is really flattering, and although I’ve leaned all the way into it in this girly interpretation it’s not at all difficult to make it work across a broad range of personal style. I think pink (particularly pale pink) sometimes gets a hard time because it’s been ultra feminine for so long, but with the changing of the guard at various fashion houses recently and with recent developments in the women’s empowerment movement, I’d say fashion is finally about to get tougher. Obviously I wear whatever costume I feel like on a given day, but I will admit that I miss the years of heavily studded everything (at least, I miss the emotion and psychology – studs are heavy, y’know?). With the rise of colour – from pastels to vivids – hopefully putting the final nail in the coffin of the ubiquity of “minimal style”, now is the time to pick your perfect pink and find the way you want to wear it. I’ve pulled a few inspiration photos into a Pinterest board here, if you need some revving up. If someone can find me some pink velvet or corduroy flares, I will love you forever. Lazy Day Vintage didn’t sponsor this – in fact they don’t know I’m writing it, I just want you all to know where to find the goods. In writing this post I went back to Lazy Day Vintage to get various links and now I have a wishlist. It’s dangerously good, you guys. Look at this emerald green blazer. And this awesome kilt (I’ll be writing about kilts soon). And this wool plaid dress. THIS HAT. Get in there, spend less than you would at a sh*tty chain store and get some really good pieces for winter. My shoes are from Ted Baker and my velvet bag is from Forever New a year or two ago.